Kauai is known as the Garden Isle as it is the wettest and lushest in the Hawaiian Islands chain. The things to do on Kauai are varied, and here are the top 10 for cruise ship travellers. 1. The best way to see Kauai is from the air in a helicopter tour. 90% of the island’s waterfalls can only be seen this way, and with so many different tours to choose from, finding the best fit for your trip will be easy. 2. Mountain tubing is a new excursion in Kauai but one of the most popular so booking early is a must. Sit on a tube and get propelled along by the current as you travel through ditches, tunnels and flumes originally built in the 1870’s to get water to the sugar cane fields. 3. One of the fun things to do in Kauai is horseback riding. With north or south shore tours available, you have your choice of things to see, all from the ease of being on horseback, on well trained animals. 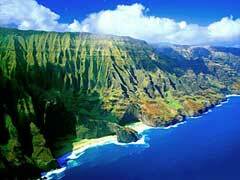 Check out the Napali Coast tours or pick one that offers majestic mountain views. 4. The Princeville Ranch Jungle Valley Adventure combines kayaking, hiking, a zip line tour and a waterfall bathing facility all into one. 5. Learn to surf from a qualified instructor where you start on land, then head to the waves to show what you learned. Also included is free time to practice your new skills. 6. Hawaii cruise vacations take you to a place that has been the backdrop for many television shows and movies over the years. On the Movie Tour you are taken on a mini-bus that shows clips of the movies filmed at the places you visit. Get out at the many sights and see why Hollywood frequents the island. 7. ATV adventures from Kipu Ranch allow you several different tours depending on your level of experience with ATV’s. Travel over some of the spectacular landscape in the 3,000 acre ranch while you are in full control. 8. Na Pali Ocean Rafting is a great tour for those wanting a Kauai whale watching experience. Explore sea caves and waterfalls as well as see dolphins, green turtles and seals. For cruise ship passengers, the afternoon tour works well with the itinerary. 9. For those wanting perfect photos, the Photo Tour is for you. Travel to the most scenic spots on the island where you will have the chance to capture the views for yourself. 10. One of the most traditional things to do in Kauai is to experience a real Luau. With Kauai Luau’s you can wander through the lovely grounds, check out the beautiful lagoons, partake in the traditional food and shows and be serenaded by Hawaiian musicians. No Hawaii Island cruises are complete without the beauty and greenery that sets Kauai apart. With so many things to do in Kauai, it is no wonder it makes a great port of call.